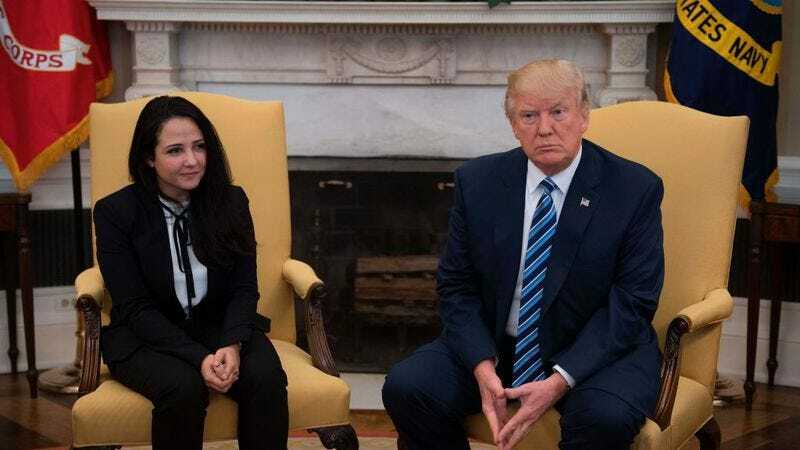 The “Aya” in “WELCOME HOME, AYA!” is Aya Hijazi, an Egyptian-American humanitarian worker who returned to the U.S. last night after spending three years in Egyptian prison on what human rights advocates say were trumped-up human trafficking charges. You can read more about Hijazi, who sounds like a badass, in this article in the “failing” Washington Post, who Trump only hates when they’re writing critical things about him, apparently. We can’t say for sure if the video, which fades between a Washington Post article about the Trump administration negotiating Hijazi’s release and a slide show of photos of Hijazi visiting the White House to the blaring strains of Lee Greenwood’s “God Bless The U.S.A.,” was personally put together by Trump, or if one of his aides handled it. Either way, you’re currently looking at the best the executive branch of the United States federal government has to offer. Way to work those templates, guys.